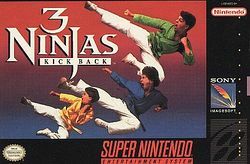 3 Ninjas Kick Back is a game for the SNES, Sega Genesis/Mega Drive and Sega CD platforms. It was developed by Malibu Interactive, published by Sony Imagesoft and was released in 1994. The game is based on the PG-rated motion picture of the same name. 3 Ninjas Kick Back follows 3 young ninja brothers: Rocky, Colt and Tum-Tum as they assist an old Samurai in retrieving a prized dagger which has been stolen by his rival. The dagger, once given to the Samurai as a reward, will be passed along to younger generations once it is restored to its rightful owner. The boys learn ninjitsu and karate as they fight evil forces that are older, more powerful, and bigger than them. Sega CD box combination with Hook. This page was last edited on 19 May 2017, at 01:29.